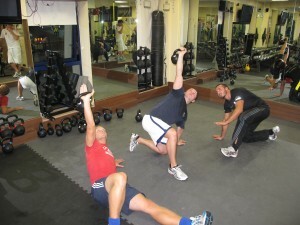 At Yourfitness we can cater to small groups for Personal Training. You and a loved one or group of friends can get one on one instruction with a highly qualified trainer, at a time suitabel to you. Maybe you know someone who wants to achieve the same goal as you. Well we have fitness programs for groups of 2-4, so you CAN do it together. We have trained couples for weddings, dance groups, and friends looking to share a positive social experience. We can tailor our programs to your needs and specified time frames. Whatever your group, you can give us a call to arrange a free consultation, and we can work together to provide the perfect training program for your needs. You can also recieve massive discounts per person when training together, so call to see what you could save.